Communities with many tobacco stores—and many stores near one another—often bear the brunt of tobacco use. Greater concentration and higher numbers of tobacco retailers, as well as retailers’ proximity to schools, have been associated with higher rates of youth smoking, higher rates of cigarettes smoked per day, and lower rates of quitting. Low-income areas and areas with many African American or Latino residents often have more tobacco stores—and more of them packed together. Not surprisingly, these communities suffer most from the negative health effects associated with tobacco use. Reducing the density and number of tobacco retailers is a promising strategy for decreasing tobacco use, curbing exposure to tobacco marketing, and promoting health equity. 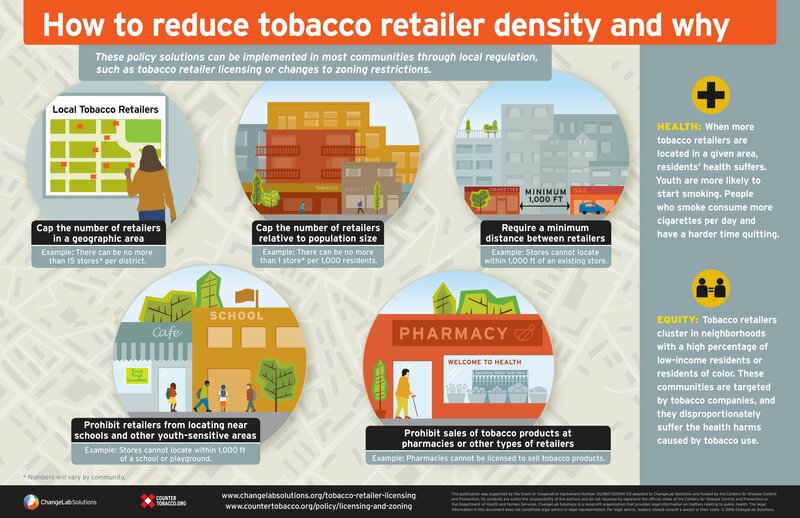 With support from the Centers for Disease Control and Prevention, we partnered with CounterTobacco.org to develop this easy-to-use infographic to illustrate 5 ways communities can reduce the number and density of local tobacco stores. This user-friendly resource provides talking points and key information to get people started on retailer density reduction. Residents, advocates, and decisionmakers can use this infographic to learn why addressing tobacco retailer density is important and to help them pick the best strategies for their community. For more about the legal considerations and related policies, see our Tobacco Retailer Licensing Playbook and CounterTobacco.org’s resources. For a longer discussion of these strategies and the legal considerations associated with tobacco retailer density reduction, see the journal article our staff coauthored, available through Oxford University Press.